Keeping the Doctor-Patient Relationship Alive Under Managed Care. The traditional doctor-patient relationship is in jeopardy. In an era of "hurry up" medicine and "patient quotas," health care professionals are often no longer able to apply good bedside manner -- the healing touch. As the focus shifts from patients to profits, this vital component of patient care diminishes and may eventually be lost. 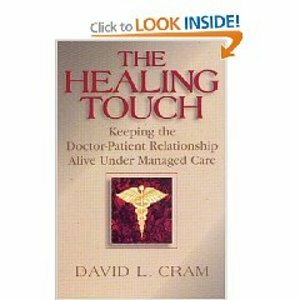 In The Healing Touch, David Cram, M.D., a master clinician, teaches the art of good beside manner and offers a valuable resource for health care professionals striving to preserve the doctor-patient relationship.